As day five of Israel’s air assault on Hmas in the Gaza continued, the Israeli government said they rejected a forty-eight hour cease fire to allow the flow of humanitarian supplies like food and medical equipment. The Jerusalem Post reported that Prime Minister Ehud Olmert and Defense Minister Ehud Barak appeared split Tuesday on whether to accept a French proposal for a 48-hour suspension of the IDF offensive against Hamas to allow Paris the opportunity to mediate a cease-fire. The Israeli cabinet is meeting again today, Wednesday, December 31. 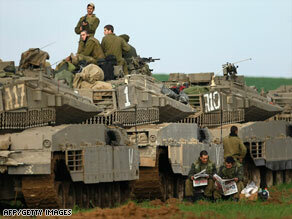 Israeli government spokesman Mark Regev said Olmert and his top advisers agreed to continue the attacks. “There is broad international consensus that the residents of the south of Israel must have a real and sustainable solution and not a Band-Aid that will just kick the can down the road,” Regev said. Several news outlets reported on intense diplomatic efforts to end the bloodshed. 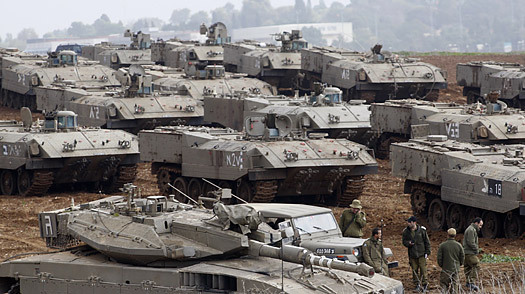 The question on everyone’s mind in Gaza is: will there be a ground offensive? Israel has been massing troops and armor along the Gaza border in an indication the air campaign could be followed by a ground offensive. The Israeli government approved a plan to call up another 2,500 reserve soldiers late Tuesday, following a decision earlier this week to authorize a call-up of 6,700 soldiers. The call-up has yet to be carried out. Many believe Israel is using a kind of carrot and stick approach to Hamas: with an emphasis on the stick which is really a hammer. “Stop the rocketing of Israel or no cease fire, the assault goes on, and perhaps a ground assault follows, that’s the startegy,” a senior Israeli officer told us Wednesday by phone…..
You are currently browsing the archives for the Regev category.